If you were to ask most people for their top five dream vacation destinations, there's a good chance that almost everyone's list would include at least one Caribbean island or country. The Caribbean is seen as one of the world's most exclusive and beautiful locations, home to over 700 islands in total. Here, the waters are warm and crystal clear, the sands are sugary and white, the local culture has so much to offer, and every single beach feels like a little slice of paradise. Many people dream of having their own private island, but that won’t happen for most of us; a trip to the Caribbean is the next best thing. There are many different Caribbean islands to choose from, with Antigua being just one of them. Known as Waladli among the locals, this island is situated in the Leeward Islands part of the Caribbean and forms the country of Antigua and Barbuda together with neighboring Barbuda Island. Home to some world class beaches and fascinating historical sites, Antigua is a must-visit stop on any Caribbean tour, especially if you're interested in seeing and experiencing the best beaches in the region. Antigua has an extensive list of exceptional beaches, with the island being blessed with one of the most visually impressive stretches of coastline you could ever hope to find. Antigua can rival any other Caribbean island in terms of beauty and coastal activities, so it's definitely a super place to visit, but choosing an Antigua beach is quite a challenge given that there are so many of them. If you're looking for the best beaches in Antigua, we're here to help. This guide will highlight some of the island's key coastal locations, offering useful information and details on each beach. This pleasantly-named beach is decorated with little rocky spots and gorgeous trees offering small patches of shade that can be very welcome on sunny days. Jolly Beach runs for around a mile in total and is located in a bay, meaning that the waters are exceptionally calm and gentle here, ideal for families with young children. Crowds can gather around the central spot of the beach, but if you walk a little further out in either direction, you'll find some more secluded spots to relax and listen to the soft sounds of island life. Scuba diving expeditions can be booked at the local shop and there's a great bar right on the beach itself selling both drinks and meals throughout the day. When we picture a Caribbean beach in our minds, the image we create usually features gentle waves, awesome views, and white sands. That's exactly what Dickenson Bay has to offer. 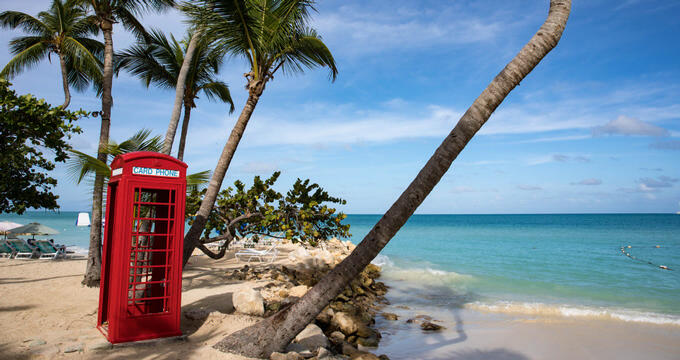 A picture perfect Caribbean beach location, Dickenson Bay is one of the most popular beaches on Antigua. It runs for about a mile in length, so there's plenty of room here for everyone, and the sea conditions make it a good spot for a variety of water sports. There are also plenty of excellent bars nearby serving up juicy fresh cocktails to help you cool off on the warmest, sunniest days. Down in the southwestern edge of the island, Darkwood Beach is one of the lesser-known beaches of Antigua, meaning that you won't see too many tourists around here, even though there are a couple of little hotels and resorts nearby. This beach is a big hit with solo travelers and couples in search of the most pristine, untouched parts of the island. There are some astonishing views to be seen from Darkwood Beach and a nice romantic atmosphere, ideal for newly-weds or those seeking a romantic getaway. Food and souvenir vendors can be found here on busy days, but the beach is generally quiet and mostly empty, with a few charming local bars offering good drinks and affordable snacks. Located on the northwestern shores of the island, Hawksbill Bay isn't the easiest Antigua beach to get to, but it's definitely worth a detour and holds a lot of appeal to backpackers in search of an 'off the beaten path' location. Alongside nearby locations like the naturist-friendly Eden Beach and Landing Bay, Hawksbill Bay is home to some of the whitest, cleanest sands anywhere on the island. The sands are so soft and perfect here, you almost don't want to disturb them, and the waters are the perfect shade of turquoise, just right for paddling, wading, swimming, and snorkeling. You have to actually pass through the grounds of the Hawksbill Resort to get to this beach, but it is open to the public like all other Antigua beaches, so it definitely deserves your attention. Not far from Falmouth Harbor, Pigeon Point Beach is situated on the southern coast of Antigua and is one of the main beaches on this stretch of shoreline. With sea grapes lining the edge of the sand, it's a really pretty beach and a lovely spot to stop off and take some photos or simply admire the views all around. Lots of locals come here to hang out at the weekends and Pigeon Point Beach is also one of the best family-friendly beaches in Antigua as well. Come here on a weekday to get the place to yourself or visit at the weekend if you prefer a lively atmosphere. There aren't too many amenities here, but you can find a restaurant or two at either end of the beach and the conditions are just right for working on your tan or splashing around in the Caribbean Sea.